Every Tuesday starting July 7 from 11 am to 3 pm freshly picked summer produce from local farms and locally produced foods will be on sale at the Princeton Farmers' Market, located at the intersection of Pine and Nassau Streets in Princeton, across the street from Blue Point Grill. The Market will feature vendors who will offer local conventional and organic produce, poultry, eggs, cheese, bread and baked goods, and fresh flowers, among other items. More vendors will be added throughout the summer. Each week the Market will also feature a guest chef from a local business for a live cooking demonstration. The chefs will be preparing dishes using ingredients from the Market. 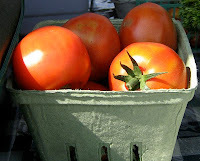 The Princeton Farmers' Market will be open rain or shine throughout the growing season. In addition to on-street parking, visitors may park in the Olive May parking lot and in the Nassau Street Seafood & Produce Co. parking lot. The Borough of Princeton and Nassau Street Seafood & Produce Co. are partners in bringing the Princeton Farmers' Market to the community.